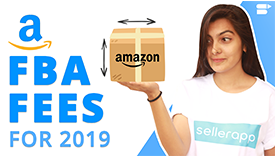 The software of choice for established and aspiring Walmart sellers providing step by step assistance and world class tools to step up your game in the big world of e-selling. We believe the Leading Amazon Sellers Love SellerApp is pretty great, But don’t just take our word for it…. Sellerapp Isn't About Being Different. It’s About Being Better. Data is no longer rare. What sellers need is the ability to rapidly discover insights to rapidly take data-driven informed actions. SellerApp's software packs allows every user to easily discover insights to optimize sales and increase profits. Discover your best selling product idea. SellerApp’s comprehensive set of tools to accurately identify lucrative product ideas. No listing has it all perfected. This leaves it with a huge room for improvements. There are numerous ways you can optimize your listing to outsmart the competition and improve sales. Want to find out how optimized your listings are? Accurately track your keyword ranking positions. On the fly data to identify how your marketing efforts are impacting your sales. Boost your sales and profits with accurate insights and data backed actionable optimizations. A complete suite of tools to power your business. Transform your E-Commerce Agency Business with ease. Effortlessly unlock your complete business potential with the SellerApp Agency Platform.